It occurred to me, as I filled out the application to the Mairie for the holiday rental of our place, that we have been French homeowners for six years now. It does not seem so long ago when we first chanced upon the house on 12 Impasse JJ Rousseau. But we certainly feel settled and comfortable living in it now. There is a sense of permanence that one can never get from rentals, hotel rooms or time shares. The quest started sometime in the mid-2000s when, after saving up for an upgrade from our Virginia USA home, housing prices escalated through competitive bidding wars. Though husband had visions of media rooms and wine cellars, I was concerned about the economics that came with price inflation and extravagant distribution of mortgages. So I proposed a distracting idea. “What about a second home that we used to discuss before we had children?” He agreed and we searched around for a mountain cabin, a beach condo, anything anywhere that appeals to vacation days and future retirement. But, alas, all the attractive places in the US were victims of rising house prices. So we turned east. We’ve always dreamt about having a pied-a-terre in Spain. So the researched on Spain continued including some visits to northern Spain that European friends recommended would be better than the drought laden area of the south. But a childhood friend who was (and is) living in Provence enticed us with an entirely new proposition. “Come to France,” she said, “and be closer to me. It is so much better here than Spain.” So we visited in 2007 and talked to her real estate adviser. Though his counsel centered more on Provence, he did acknowledge that Languedoc Roussillon was a beautiful place and worth checking out. “Much cheaper than Provence but more rural,” he admitted. So we took a one day dash to Herault, Languedoc Roussillon where we checked out four houses through a local immobillier (real estate agency) whose staff spoke very good English. None of the houses made a lasting impression. But the vineyards, rows and rows of them as soon as once crosses the border from Provence to Languedoc, stood out in memory. As we left Languedoc to return to my friend’s place in Provence, I told husband, “This is it! No question, this is our place and I’m going to find us a house! !” I don’t recall his answer but I like to think he was just as mesmerized with the region. So armed with more internet research and scheduled appointments with four real estate agents (France has no multiple listing system), I returned on January 2008 to begin the house hunt. A friend accompanied me and we rented a house in Olonzac for the week. In a span of four and half days, I viewed about 16 houses in all shapes, locations and prices. Unfortunately, at the same time, the dollar euro exchange reached its highest point and my budget had to adjust accordingly. Ça va sans dire. During our viewings, we encountered one house located at historically preserved village and it was straight out of a Hollywood film. My friend asked the agent, “People actually live here? It looks like a movie set.” He replied, “Yes, it is a regular village but exteriors cannot be changed or can be improved only with government permission. It is designated as historic.” The medieval stone house was charming. And it came with its own grange (stone barn) across the cobblestoned alley for summer dining and wine storage. And, of course, it was surrounded by vineyards. My friend turned to me and said, “The house looks great, it is furnished, and the reasonably low price is attractive. But your daughters will not like it as there is nothing here. No school, no boulangerie. Great if you’re a writer and want seclusion. But your family will like some company for sure.” She had a point! By Thursday of that week, I was resigned to the idea of returning in April. None of the houses moved me. It was a matter of heart and not just budget. So on Friday, committed to another appointment, we met another agent. She had emailed many questions about our preferences, use of the house, family composition and the like. When we met her, I specifically asked to see a property in her portfolio. The location was ideal. 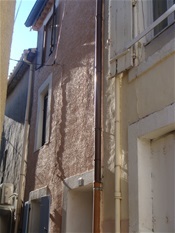 It was within the village circulade, close to the old chateau, and in a pedestrian only street. The interiors looked like the home of someone’s grandma which was not surprising since an elderly Scottish woman had lived in it. Though it had promise, I know husband could not visualize its potential. So the agent, convinced that the village would be ideal for us, took me to another property a few steps away. It was completely renovated inside. It was very basic but, nonetheless modern, bright, and welcoming. There were three floors with one room on each floor and enough space for the parents and young children. Plus it was nestled nicely in this small, car-free alley with good street lighting and privacy. Though a bit above my now reduced budget, the agent negotiated the price effortlessly. Thus, by April, we became homeowners in a country far from our own; but now familiar rather than foreign. C'est comme ça!